April 21st in WordPress Themes by Wordpress Jedi . The Divi Builder is an awesome page builder that lets you customize your pages via a drag & drop interface. We have already covered the plugin a bunch of times here in the past. Extra for WordPress happens to be a theme that relies on the Divi Builder for customization. 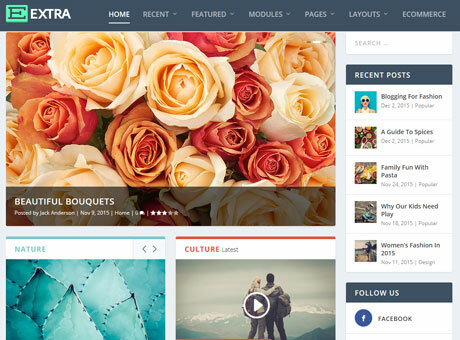 It is fully responsive and puts you in full control of your page and post layouts. Extra comes with a review system that invites your visitors to rate your articles. It is ready for WooCommerce. The Divi Builder has been extended to work on your homepage and categories. You also get pricing table, tabs, audio, call to action, and a variety of modules to enhance your site. Extra works for a wide variety of sites. It gives you control over the structure of your content. You get various header options and a custom type to showcase your projects. Did we mention that the Extra theme has a mega menu system? This is a commercial theme.